Vollmecke has an abundance of lettuce right now, but it won’t be around for much longer, so make sure to get the most of it. Although lettuce is one of those vegetables that is heavily associated with one dish (salad), don’t let that limit you. Lettuce has a lot of untapped potential. At most grocery stores, you will find “green,” “red,” and perhaps some romaine or iceberg. Here at Vollmecke Orchards, we grow many kinds that are too delicate to withstand shipping and storage, so you will only find them here. Our favorite? Nancy Butterhead! Make WRAPS! Instead of a tortilla, use a giant lettuce leaf! Much healthier, and adds some crunch. Try these lettuce wraps, based on the delicious ones served at P.F. Changs. Juice it! Combine it with some strong fruits in your next juice or smoothie. Because lettuce has a subtle flavor, it won’t make your juice taste like liquid lettuce. This is a great way to stay hydrated! Shred it and add to dips! Lettuce is especially good with Mexican themed dips, like seven layer or enchilada dip. Put it on a sandwich! This seems obvious, but I know I sometimes forget about adding lettuce to sandwiches. Great way to eat your vegetables without overwhelming the meal. Grill it! Yes, grill it!! Marinate in some Italian dressing and throw a whole head on the grill. Excellent BBQ/picnic side! Here is a Grilled Caesar Salad recipe. If it sounds like a lot of work, just substitute your favorite dressing for Casar dressing. Make Soup! I know it sounds odd, but a fresh spring lettuce soup is actually quite delicious. PRESERVE IT! You can actually freeze lettuce. We don’t recommend this for all of your lettuce, but don’t let it rot in the fridge just because you can’t eat it fast enough. If you feel like your lettuce is getting close to the end of it’s life, follow these instructions and save it for later (keep in mind the texture may be compromised). To make sure your lettuce lasts as long as possible, you will want to store it correctly (click here to see how to store other veggies). We recommend washing lettuce right before you eat it in order to maximize shelf life. But if you do want to give it a quick rinse, dry it THOROUGHLY before storing in a loose plastic bag. 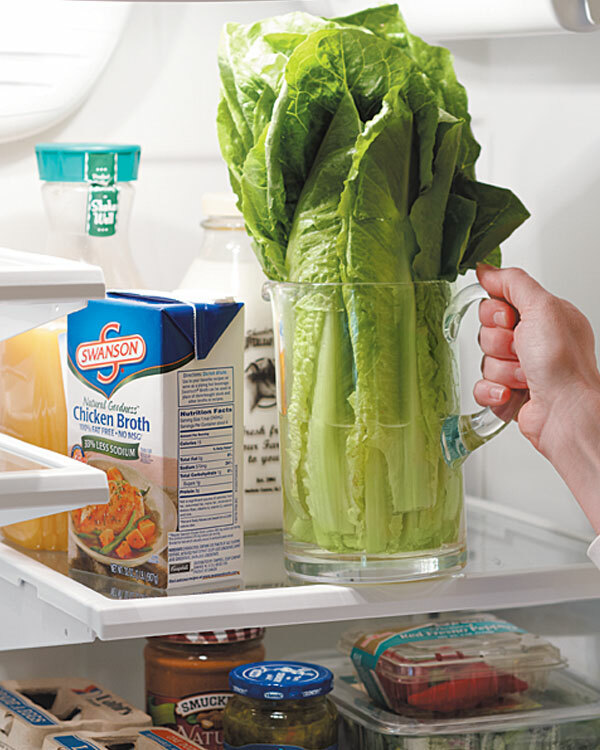 OR you can put taller head lettuce in an upright pitcher with a little bit of water (like so: picture). Both options will help your lettuce stay tasty and fresh longer. Do you have any interesting or unique recipe ideas? Lettuce know! Nancy Butterhead, the most delicious butter crisp lettuce you will encounter. Sometimes Mother Nature does not work on our schedule. What we planned to be a leisurely harvest of lettuce over the course of the Spring season, has turned into a full-on race to get it all harvested before it rots in the field. This condensed schedule was brought on by close to 8 inches of rain in the past two weeks, which caused two things: the lettuce to grow extremely quickly and for its shelf life to be reduced somewhat due to the rapid growth. So yes, more lettuce in your shares, yay! Not to brag or anything, BUT, it is absolutely gorgeous lettuce, and varieties you won’t find in anywhere else. For instance, our favorite variety this year is Nancy Butterhead. For one, we just love saying the name, but it also is one of the best, most delicate and flavorful varieties we have come across in a long time. You will never find this in a grocery store because it is just too delicate to ship. So, besides making a salad, what can you do with lettuce? You can add it to a sandwich, for an extra bit of flavor and crunch. Or, why not try a refreshing chilled lettuce soup? Lettuce cups or wraps are showing up on menus everywhere lately, from P.F. Chang’s to Chez Panisse. Basically, take any “filling” you like, such as egg or chicken salad, or spicy Thai chicken or pork, and wrap it in a lettuce leaf—voila! no fork required—just roll it up and eat like a burrito! Below are some of the recipes we have been handing out on share days, plus online links to few fun spots. Huffington Post has a new weekly column, highlighting the more unusual things you might find in your share box. Last week they featured kohlrabi, and this week it is garlic scapes. Two very timely, and underrated, vegetables. Joy and Kate harvesting pea tendrils in the early morning.